Save 1% on the Kidde Plc 21027682 2PK DC Smoke Alarm - Quantity 1 by Kidde at N Online Agency. MPN: 21027682. Hurry! Limited time offer. Offer valid only while supplies last. Intelligent Wire-free 10-year lithium battery operated Smoke Alarms offer a wire-free interconnected network that offers whole home protection. View More In Smoke Detectors & Fire Alarms. Intelligent Wire-free 10-year lithium battery operated Smoke Alarms offer a wire-free interconnected network that offers whole home protection. Connect up to 48 devices so one alarm detects smoke all connected alarms will sound. 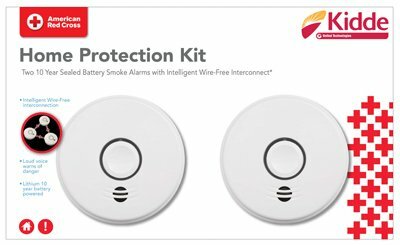 Connect with a Smart Bridge (sold separately) to monitor smoke alarm activity via the Kidde RemoteLync APP. Connect with RemoteLync Camera and Wire-Free Combination Smoke and CO Alarms and be alerted while away from home to fire related threats. This alarm detects products of combustion using photoelectric technology. With Voice warning and Wireless Interconnection, when one alarm detects smoke, all units are alerted via a wire-free network. Powered by Lithium Battery Operated with Ten (10)-years of protection, after the unit is installed, this unit will automatically alert you that it is time to replace the unit.